Obit We're sorry to bring news that John Wharton, a popular and influential figure in Silicon Valley, died last week. Wharton was the architect of the machine-language instruction set of the Intel 8051 micro-controller, one of the most widely used (for a time, the most widely used) chip in history (PDF). In a 1999 profile, The New York Times described him as "a Zelig-like presence in Silicon Valley for more than two decades", detailing his skill at reverse engineering. Wharton was active in the Asilomar conferences and as a technology consultant. But a list of career accomplishments cannot begin to capture his influence as a gadfly and troublemaker, his wit and roaming intellect. "Eccentric and perfectionistic," his friend Brian Berg recalled. He appeared on the David Letterman Show, his favourite, and was also a huge early supporter of The Register. In 2001, he was keen to meet its first reporter in Silicon Valley – and invited me to Stanford University, where he guest lectured and helped run the EE380 Colloquium. That summer day, John had brought along a rare technical document (above) and there was a tale attached. In the autumn of 1980, John had been at Intel to receive a visit from the 24-year-old CEO of a tiny software company called MicroSoft that specialised in programming languages. Wharton headed a technical team conducting an evaluation of the software Bill Gates brought with him to the meeting. At the time Intel, sensitive to the competition authorities, meticulously held pre-meetings and postmortems. The IBM PC would become huge, the young visiting CEO explained, John recalled, and what Gates proposed was a three-way division of the computer industry. IBM could take what we now call enterprise computing. Intel could take embedded systems, while Microsoft could take the personal computer. At the time, Intel had 20,000 employees, Microsoft around 30. The three Intel staff looked at each other with astonishment, one asking John: "Did we just hear a classic antitrust carve-up?" Wharton made a discovery in the document Gates had left behind. 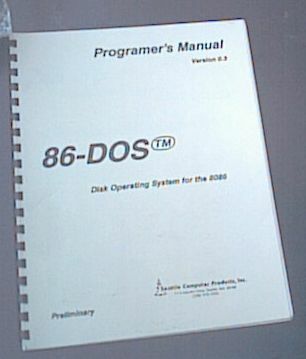 It was the technical reference for an Intel-compatible operating system developed and sold with a plug-in board. In July 1980, Gates' Microsoft bought the one-man outfit who sold it without revealing its purpose: the default operating system for the new IBM PC. 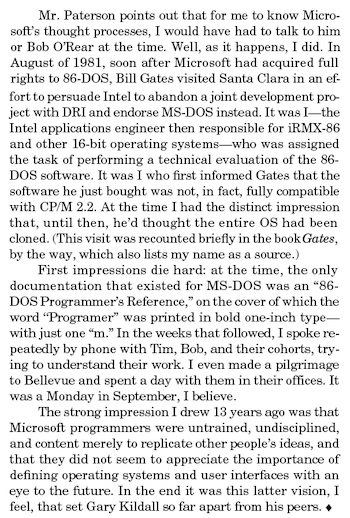 "I had to inform Mr Gates that the operating system he thought he had bought was a copy of CP/M. Not only were the first 36 functions identical, but also the parameter passing mechanism." CP/M was then the most popular licensed PC operating system running on hundreds of systems. That detail became important when the author of QDOS, Tim Paterson, sued Sir Harold Evans for libel in 2005. Evans had told the tale in his book, recalling how Microsoft copied code. Paterson's case was thrown out two years later. When Spectrum IEEE ran a piece which attempted to reassert MS-DOS's paternity, once again Wharton provided technical detail which refuted the story. We were last in touch after the actor Stephen Fry smeared CP/M author and Digital Research founder Gary Kildall's reputation in 2014. You can see Wharton below, courtesy of the Computer History Museum, expanding on Digital Research and Kildall's legacy. Wharton died on Wednesday evening in Redwood City, Ca.